There was way more to this earnings announcement than just bad news about rising costs. Costco's (NASDAQ:COST) management team has made no secret of the fact that they aim to win market share rather than maximize short-term profits. This approach has delivered stable, and growing, earnings over the long term as well as an annual sales base that's now over $140 billion. But Wall Street still seems to get fearful whenever the retailing giant hits the accelerator on that strategy. The warehouse retailer's fourth-quarter earnings report was a good example of that process at work. Costco announced some of its best growth numbers in years this week, while costs ate up a bigger portion of that sales base. Investors chose to focus on the profit pinch and pushed the stock lower immediately following the report. Yet there was more good news than bad in Costco's announcement. Let's look at a few of the standout metrics that investors might have missed. Sales growth came in at a robust 8% after adjusting for store openings, gasoline price shifts, and currency exchange moves. That was enough to significantly outpace peers like Walmart, which grew comparable-store sales at a 3.4% rate, and Target with its 5.1% increase. Both of these retailers announced a growth slowdown between the second and third quarters, but Costco's expansion pace held roughly steady. Looking deeper into that top-line number reveals just how strong its demand trends are. Customer traffic was up 5.2% to continue its best expansion pace in years, and Costco added to that healthy figure with big gains in the online business and by adding stores to its retailing footprint. Altogether, revenue jumped by $3.2 billion, or 10%, to pass $35 billion. Wall Street was worried about spending pressures heading into this report, and the chain did post a significant operating margin decline. The main culprit here was a drop in gross profit margin down to 10.75% of sales from 11.25% a year earlier. However, executives explained in a conference call with investors that most of this slump had to do with temporary factors like a change to the way they are accounting for costs tied to the co-branded credit card. Sure, Costco is aggressively defending its price leadership position while also spending cash to build out new offerings like same-day and next-day grocery delivery. But its overall profitability picture -- describing growth that bucks the wider industry downtrend -- hasn't changed. 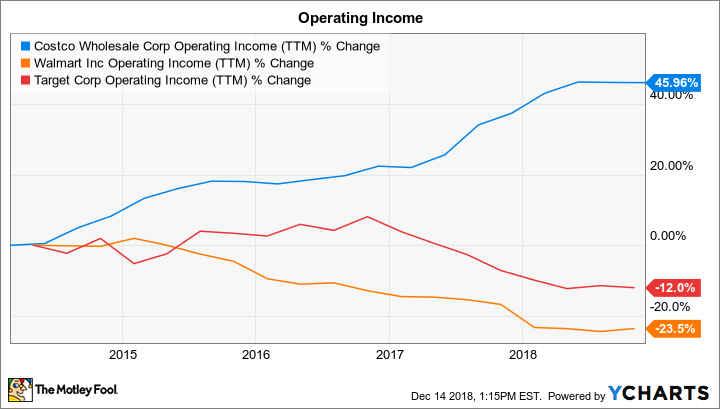 COST Operating Income (TTM) data by YCharts. Costco is more of a subscription seller than a retailer because most of its earnings come from the annual membership fees it charges for access to its warehouses. The company recently enacted a price increase, too, giving its customers a reason to take advantage of its generous cancellation terms and let go of their memberships. But instead of a downtick, renewal rates rose to 90.5% in the core U.S. market from 90.4% this quarter. That increase, combined with the higher fee, allowed membership income to rise by 10.4% after adjusting for currency exchange moves. The rate rose on a global basis, too, improving to 88% from 87.9% in the prior quarter. Plenty of cost challenges are looming over the next few quarters, including the potential for big tariff charges and extra spending on e-commerce fulfillment. Yet there's no reason to think Costco can't handle these issues as well as it has for recent moves like wage increases. And even if profitability does trend lower in fiscal 2019, that would be a good trade-off if it helps the retailer extend its strong market-share performance into the new year.